I don’t know about where you are, but we’re having a solid warm, summery weekend here in Colorado, and while I still don’t trust that summer has completely started, I think we’re getting there. We’re working with pound cake today, which is tough one for high-altitude baking. Pound cake has such a specific texture and light flavor, and it’s always been hard for me to achieve. You want it to taste just lightly sweet (even though somehow it has a ton of sugar in it??) and the crumb should be very tight- it’s a sturdy cake. And of course, you want that sugared crust on top. 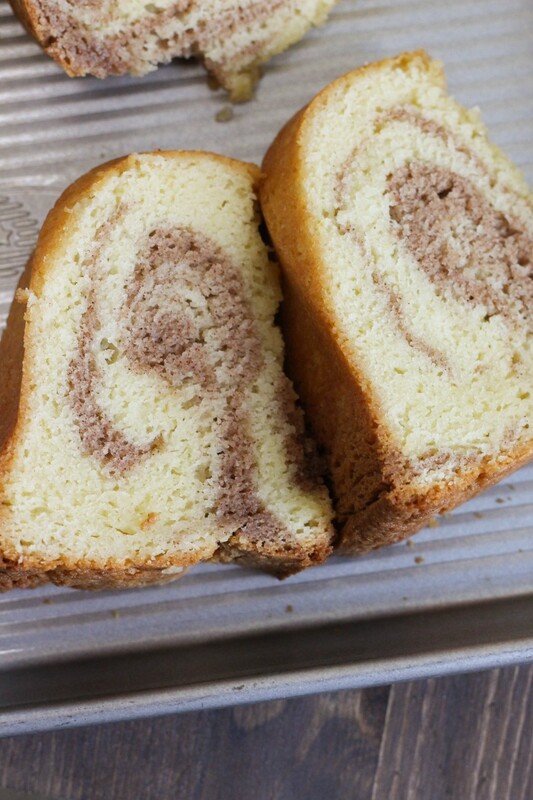 I typically run into a couple of problems with pound cake- first is that it’s too sweet. I think that while in some cases it’s harder to bring out flavor in recipes at altitude, the sugar really pops for pound cake, sometimes so much that it makes the cake bubble over. I find the best way to address this is to simply reduce the sugar in the recipe, by as much as half or one full cup. 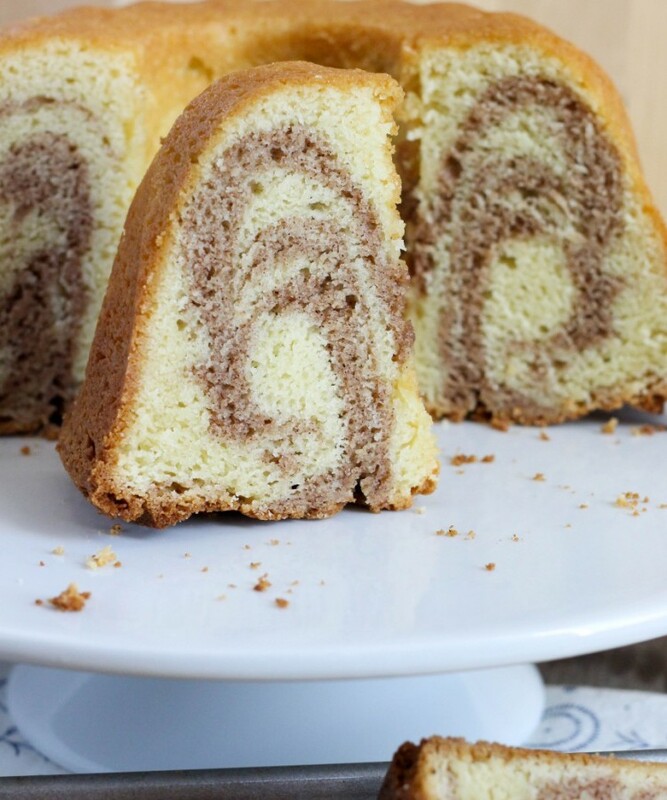 I know that sounds like a lot, but it typically works for me when it comes to pound cake recipes, though this does NOT apply to normal cake recipes. Next, the texture. This is a simple fix that does apply to many other cake recipes- it’s the leavening. When it’s not right, I usually find that it’s got lots of air bubbles, and the texture isn’t tight enough. If you reduce the baking soda or baking powder just slightly, by 1/8-1/4 teaspoons, you should see a big difference in how it bakes. Now, onto the recipe at hand. 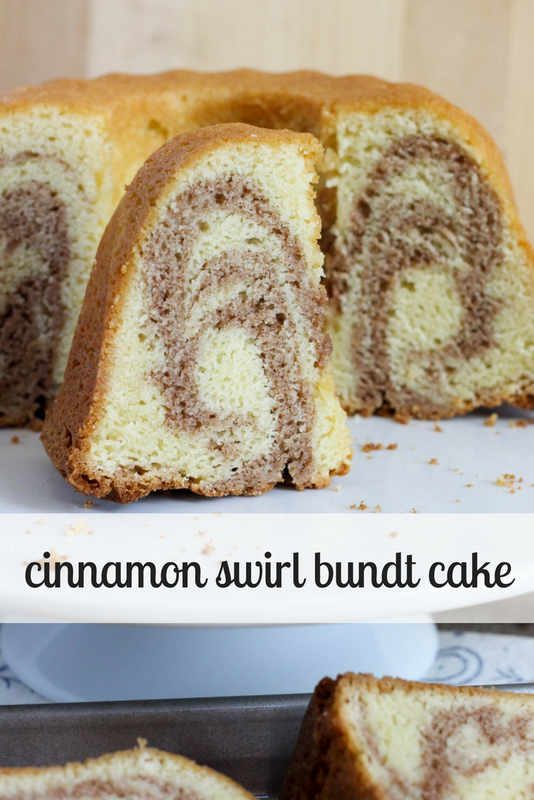 This is a classic pound cake with a swirl of cinnamon cake running throughout, and the results are SO GOOD. Just lightly sweet, cinnamon-y and the perfect texture. 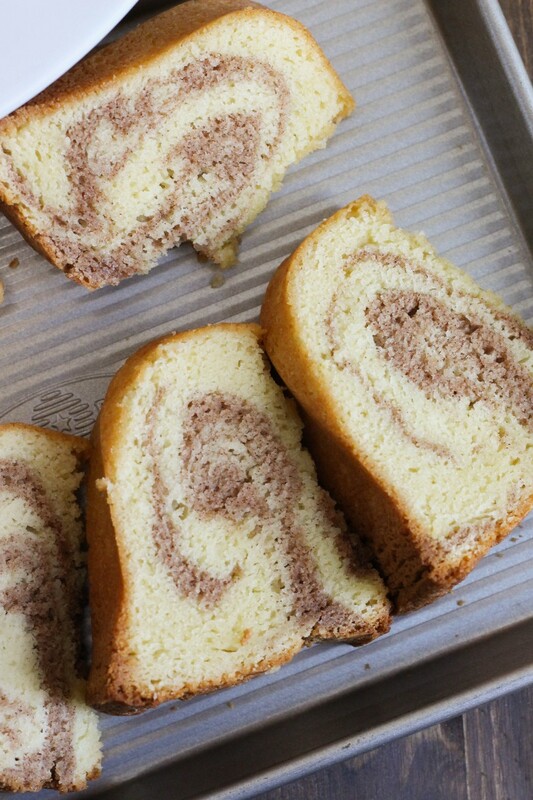 To make the cinnamon swirl, you simply add cinnamon to a portion of the original cake batter, and layer it on it. 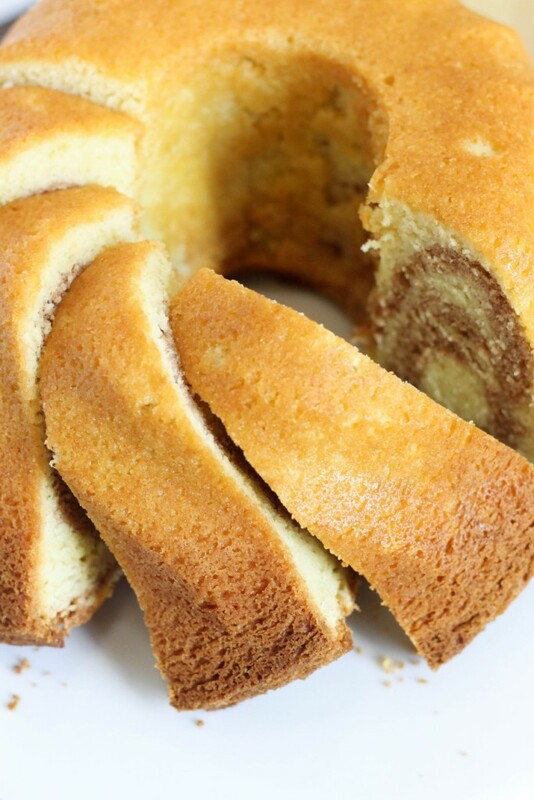 Pound cake is a simple favorite, and I’m a fan of all variations. This one is great with morning coffee, or afternoon tea, or as a midnight snack. All of the above. Enjoy! Preheat your oven to 325 degrees, and generously grease the bundt pan of your choosing, standard size. In a large bowl, beat together the butter, sugar, and sour cream until fully combined. Beat in the eggs one at a time, and then the vanilla extract. Add in the flour, baking soda, and salt, and beat until completely incorporated. The batter will be fairly thick. 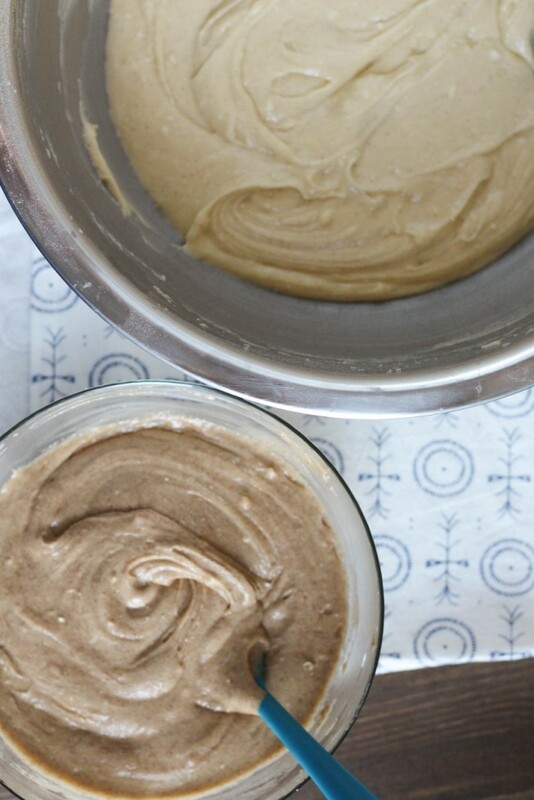 Remove about 1/3 of the batter into a separate bowl- this does not have to be exact. In the smaller portion of batter, stir in the cinnamon until combined. 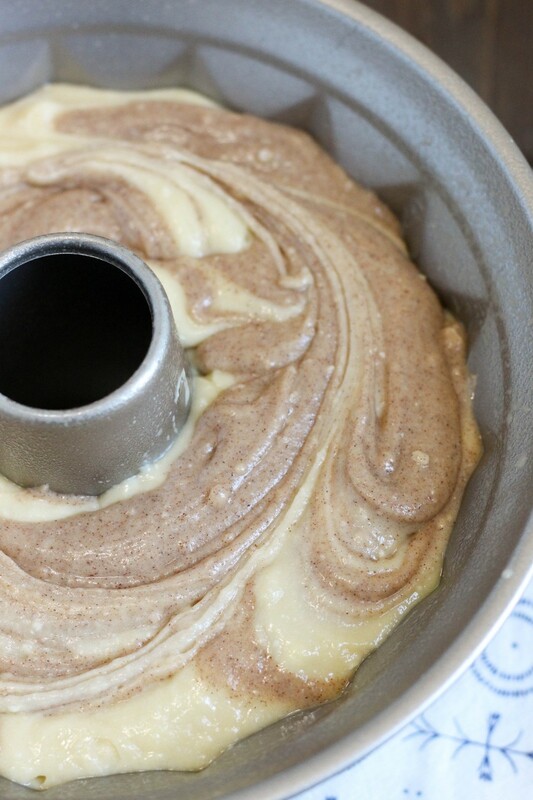 Pour about half of the original cake batter to your bundt pan. Then add about half of the cinnamon batter in dollops around the pan. 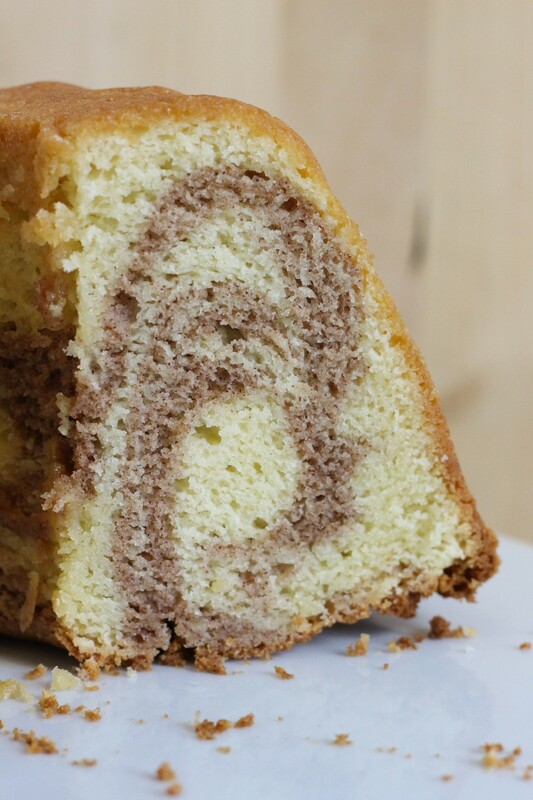 Using a butter knife, swirl the batter together. Repeat the process with the remaining original and cinnamon mixtures. Bake for 75-80 minutes, or until a cake tester comes out clean. 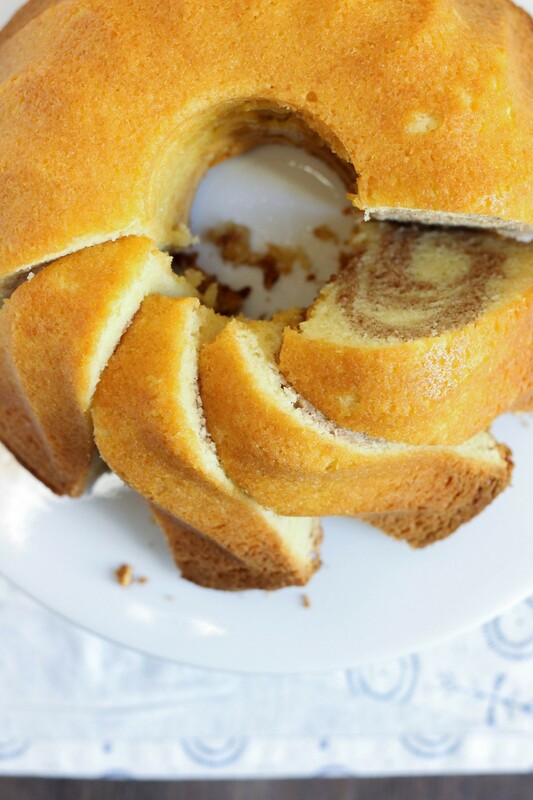 Cool for about an hour in the bundt pan, and then turn it out to slice and serve! Enjoy!